James Fitzroy’s life could be called charmed. With an ancient name and a sprawling country estate, only an arranged marriage stands between him and his billionaire inheritance. But appearances are rarely what they seem. Traumatised after a tragic accident, speaking doesn’t come easily to James, and he cares little for anything, including who he weds. Beth Grace might be descended from criminals, but she’d never follow in their footsteps. Apart from the one time she did. 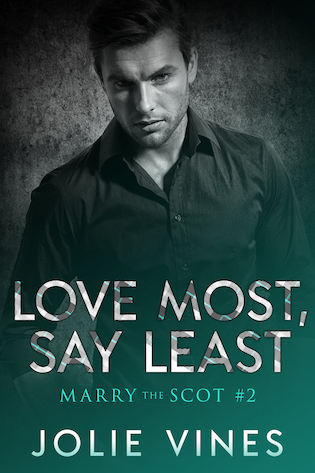 Now, even an invitation to go driving in Scotland with the world’s most handsome man can’t derail her from her plan to pay her dues. Besides, despite the startling chemistry, women like her don’t get to date earls. She couldn’t be further from what he needs. From an early age, Jolie lived in a fantasy world and is never happier than when plot dreaming. Jolie loves her heroes to be one-woman guys. Whether they are a huge Highlander, a touch starved earl, or a brooding pilot, they will adore their loved one until the end of time.